“What a gift,” said D. Joshua Taylor of genealogy on prime time television. 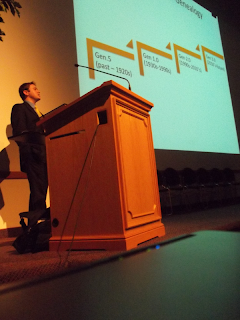 “Once they’ve had a taste, they always come back for more.” Taylor made the remarks in his “Genealogy in Prime Time: Family History’s Next Generation” keynote at the 2011 BYU Family History Conference. Taylor is currently director of education and programs at the New England Historic Genealogical Society. Genealogy has gone through several generations, each with successively better technology, better access to records, richer interactions among genealogists, and an ever widening potential audience. “Genealogy will change because the tools are changing with it,” said Taylor. iPads are used for taking notes and photographing documents. In the future, keyboards will be projected images on your desk. Paper will be able to talk. Imagine if your pedigree chart was interactive and talked to you! Drag a document image onto your tree and it will fill in the information where it goes, complete with source citations. “Genealogy will no longer be an activity for old people. It will be undefined by age, gender, or nationality,” he said. Younger people want Interactive results represented in digital format. The experience will become more important.